This McDavid Hex Leg Sleeve is intended for knee and shin protection against different outer impacts during basketball games to prevent knee or shin injuries, for example, bumps, bruises, abrasions and scratches. These leg sleeves are very popular among college and pro players, especially among NBA basketball players. This McDavid leg sleeve has 9 mm thick HexPad foam padding which is made by using special HEX technology – padding is made of independently positioned hexagon shaped pads which are providing better conformation, comfort, performance and protection, so players can feel comfortable and fearless on the court. This product also has HydraVent hDc Moisture Management technology which ensures moisture wicking properties, therefore, athletes stay cool and dry all game long, feeling constant comfort. 3 inches long extensions of fabric on the top and bottom of the sleeve provides superior fit and comfort, and additional protection against different knee injuries. 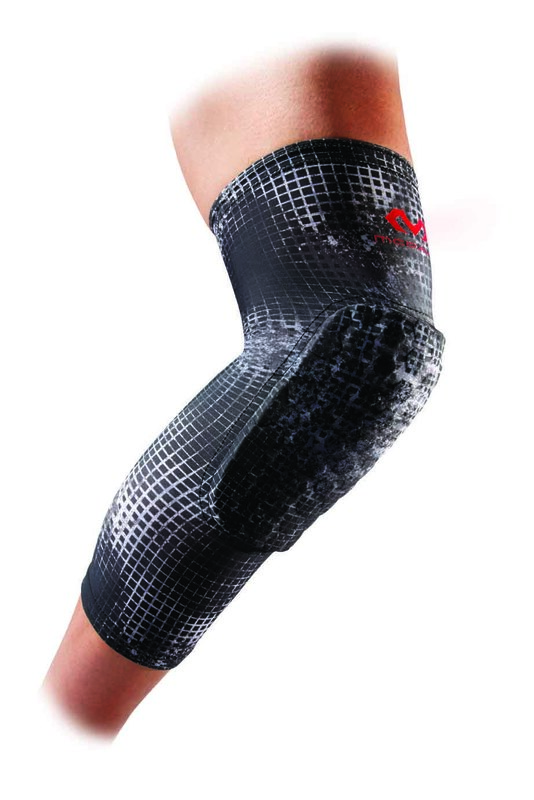 This McDavid Hex Leg Sleeve has compression functions as well – compressive fabric holds the knee pad firmly in the place and keeps muscles warm, preventing fatigue and pulls. Thanks to special color and pattern of fabric, this McDavid leg sleeve has modern and stylish look. It has abstract pattern which is colored in navy and white colors. HexPad foam padding is offering interesting look as well. This leg sleeve has red McDavid logo on top. To find out your size, you have to measure your knee circumference. When it is done, follow the size table below. This McDavid Hex Leg Sleeve is manufactured for knee and shin protection during basketball games to prevent knee injuries. This product is made of nylon (80%) and spandex (20%), and it comes in special MGrid color. It is available in four different sizes – S, M, L, XL and its size depends on its size. As this leg sleeve has various sizes, it is suitable both for adults and youth. This McDavid product includes HEX technology and HydraVent hDc Moisture Management technology. Another features of this product is extended length for better protection and compression functions for muscles protection against fatigue and pulls. This McDavid Hex Leg Sleeve can be washed in washing machine and usually it is sold in pairs. Yes, they can even be washed in the washing machine.